The DJC reported that development at N Williams and Knott will wait a little longer* as a Prosper Portland oversight committee scrutinizes plans for the property. Portland Architecture reported on the winners at the 2017 AIA Portland Architecture Awards. Projects in Portland that received prizes included the Japanese Garden Expansion and Pearl West. The OMSI Masterplan could involve re-aligning SE Water Avenue and adding a two-way cycle track, according to BikePortland. “With its wildly colorful artist-painted exterior, the Fair-Haired Dumbbell gives Portland a reason to smile,” according to an article in the Business Tribune. After almost 30 years of plans, ground finally broke on the Convention Center Hotel, writes the Portland Business Journal. In a cover story about how Portland is changing, the Willamette Week looked at 7 places where this city could soon go big. The Design Commission last week approved the Providence Park Expansion, according to the Oregonian. City Observatory looked at how luxury housing becomes affordable, with historic examples in Portland. 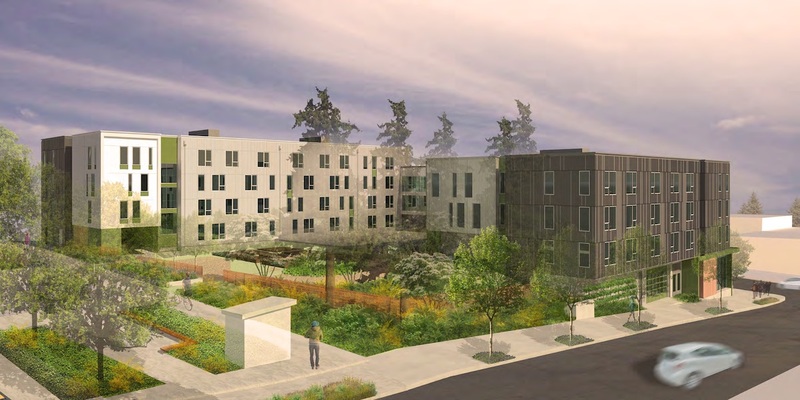 With very few new projects submitted to-date under the city’s new inclusionary zoning ordinance, BikePortland looked at Urban Development Group’s plans to swap parking for affordable housing at 2548 SE Ankeny St, 316 NE 28th Ave and 2789 NE Halsey St. The Portland Tribune reported on slips in the schedule for two city initiatives designed to tackle housing affordability: adoption of the Residential Infill Project, which is now delayed until late 2018; and spending of the voter approved affordable housing bond.